A great way to make your event the talk of the town! ...alternatively, a handmade stamp adds a unique touch. One cold night in November, a Cambridge College was transformed into a Winter Wonderland. There were some fantastic headliners, plenty of food, drink, merriment, fake snow and also a performance by HaHa caricatures. As soon as the artist arrived, a large crowd could be found huddled in ‘Santas Grotto’. The brave choosing to queue up and have their picture drawn at once, and the curious peering over the shoulders of others to watch the artist perform. The drunk, of which there were many, provided ample background noise and cheers of delight and enthusiasm as the performance went on. 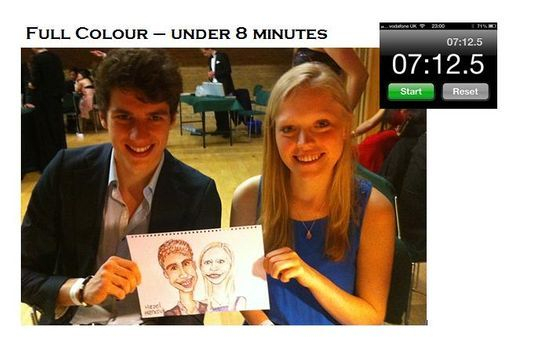 During the four-hour performance, it was non-stop, with an average of around EIGHT full-colour caricatures completed per hour! 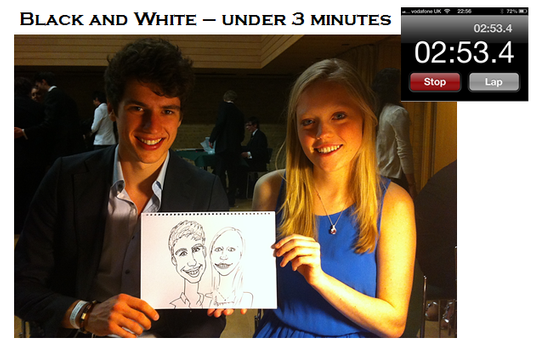 HaHa Caricatures thanks the college, the organising committee and the guests for such a memorable night! The Oxford College was buzzing with energy right from the off. After passing the dessert room (yes a whole room of puddings! ), the main stage and the bar, at the very heart of the ball guests were treated to an array of entertainment. In one corner, ball-gown clad guests wowed their friends taking turns to ride a mechanical surf board, whilst in another corner beauticians delivered hand massages, manicures and elegant face paints whilst a photographer snapped away. In a third, from 9pm - 1am there was a very popular performance by HaHa caricatures. After the four hour performance concluded, the artist then conducted an entire hour of encores..... a new record! When it reached 2am, still the guests kept coming and pleading for more. Then when it truely was the end, guests were still enthusiastically requesting autographs (a new experience for the artist!!) and asking to take home the remaining ink prints of the ATLANTIS ball logo to remember the event by. It was great to be invited back to Oxford again, by one of the guests drawn at ATLANTIS, just two weeks later, to perform at this wonderful masquerade party. The intimate venue was lit by soft candle-light adding to the mystique of a party filled with mysterious masked guests. All creatures wise and wonderful, all creatures great and small, humans, horses, cows, pigs, tractors, a pink bear and even ET made an appearance at the hunt ball. Each table nominated a lucky guest/victim to be drawn and to tell their story! Guests shouted out instructions from all sides about how best to describe their friend(s), and when the final picture was revealed a round of applause and a big cheer confirmed everyone was having a great time!! Even if the person in the picture denied all charges!! !